Our Alamo Heights location’s address is 1248 Austin Hwy, Suite 202B, San Antonio, TX 78209. This is our flagship location. 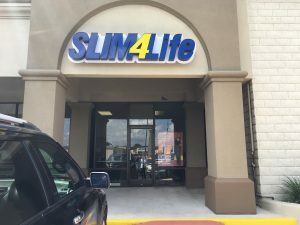 Located in the Austin Highway Shopping Center next to Gold’s Gym and across the street from Target has really made this a very prominent location. The staff at Alamo Heights are living up to their motto, we care! The staff set up an individual program for each client and work with them one on one until they achieve their goal weight. A client then goes on stabilization where we incorporate all foods back in to their program and then maintenance begins so they can be Slim4Life. The Alamo Heights staff cannot wait to help you achieve your goal weight. Make an appointment at our San Antonio – Austin Hwy weight loss center today!